Create a single e-commerce solution for sister companies. Funnybone Toys and Funnybone Muse each company had its own identity and own specialty and own website. Funnybone Toys is about games created by the company. Funnybone Muse is all about arts and crafts. One thing the companies have in common is a love of design. 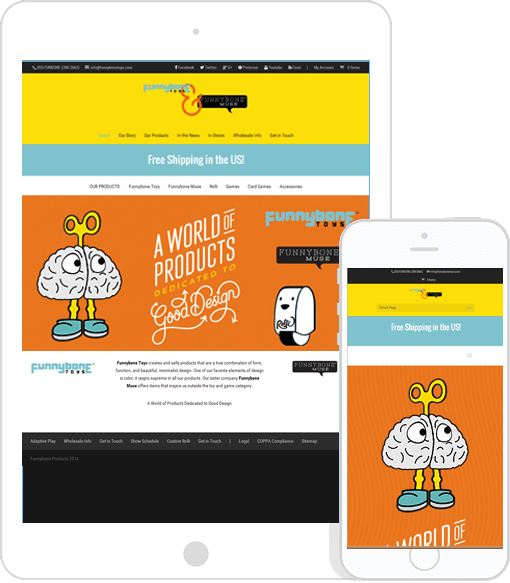 Funnybone Products founders decided to combine all products and create FunnyboneProducts.com. The result is a brightly colored e-commerce solution that appeals to people of all ages. The design is simple, yet bold. The navigation allows the user to quickly find the items they’re looking for, and browse other items in the shop. With so many using mobile devices for everything these days, it is important that Funnybone Toys and Funnybone Muse shoppers be able to complete purchases on their mobile devices. Originally, Funnybone Muse and Funnybone Toys used two separate websites. Combining the online stores streamlined everything from bookkeeping to order fulfillment. Take a peek at Funnybone Products and see for yourself.